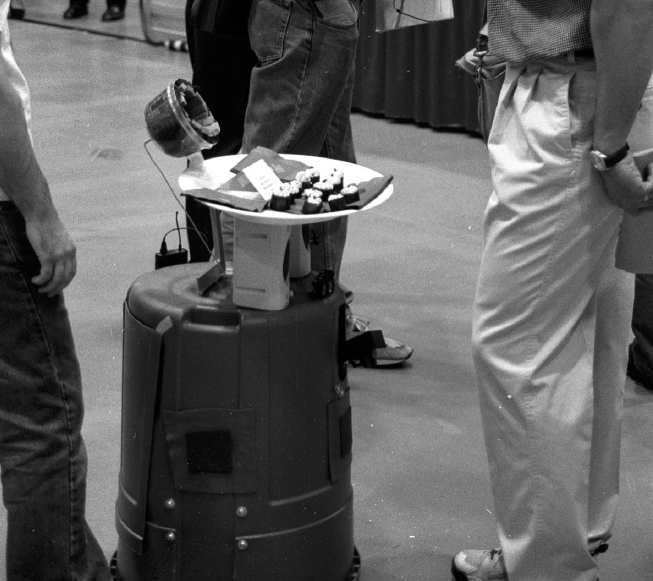 In 2001, the AAAI (Association for the Advancement of Artificial Intelligence) conference had five teams of robot butlers battling to the death. Well, not so much to the death, and more to the serving of hors d'oeuvres. The competition it seems was to see who could create a robo-butler capable of successfully determining how much hors d'oeuvres were needed by the conference-goers whilst being creepy. Just so future generations know, this is also what another robo-butler looked like in 2001. A headlamp tethered to a garbage bin and a plate of sushi held up by a smattering of discarded cell phone boxes and a kiddie hockey stick. It was a quaint, simpler time. The winner of the competition was JOSÉ, a tuxedoed laptop from British Columbia. I wish I had more to say about this competition, but I think you get the idea--a bunch of AI enthusiasts back in the day threw some webcams on wheels and coded them to haul filo. Then the Canadians won. Story of my life. If, for some unrobogodly reason, you'd like to read more, you can read the AI Magazine article, which is where all the images came from.